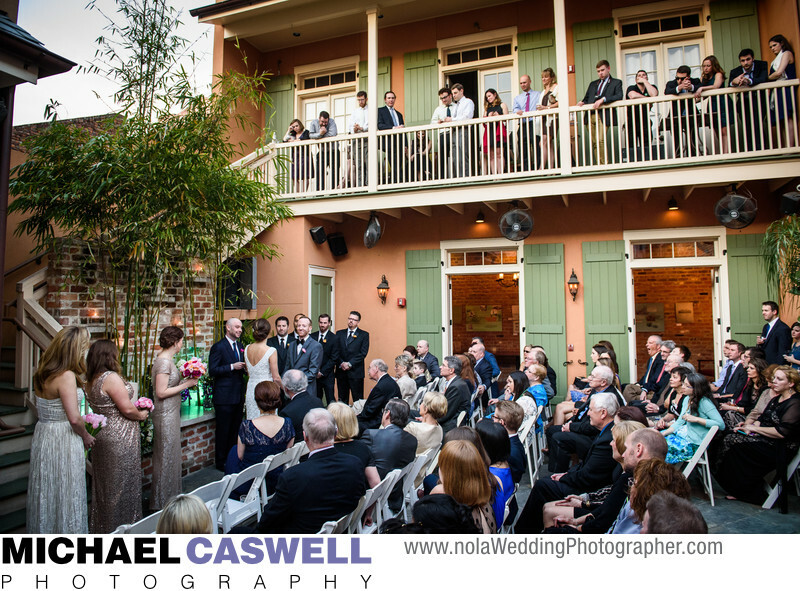 This couple's officiant was a friend of theirs, and their wedding ceremony in the courtyard of the Irish Cultural Museum in the French Quarter was full of many lighthearted and amusing moments, which fit this couple perfectly. While the best light for outdoor weddings is typically the last half hour or so before sunset, the walls that surround most courtyards help extend this window of good light considerably, as they generally block direct sun and provide good shade to work with for up to several hours before sunset. The Irish Cultural Museum is a relatively new venue, and I've photographed several wedding ceremonies in their courtyard. Though the building is modern, having been recently constructed, they did a great job at maintaining an appearance consistent with the older buildings in the French Quarter. They can also host receptions, but this couple's reception took place at the now closed Musee Conti Wax Museum, which was conveniently located right next door. The event was expertly coordinated by Kelly Sherlock. Location: 933 Conti St, New Orleans, LA 70112.